"This cut is very tender yet easily prepared and cooked! Served best with fresh baked potatoes." Season the steaks with lemon pepper, onion powder and garlic powder on both sides. Wrap in plastic wrap and marinate for at least 2 hours in the refrigerator. Preheat the grill for medium-high heat and allow the steaks to come to room temperature. Unwrap steaks and place on the preheated grill. Cook to your desired degree of doneness, about 3 minutes per side for medium rare. Allow steaks to rest for a few minutes before serving. Good basic rub, I jazzed it up with dried Italian seasoning and chili powder. 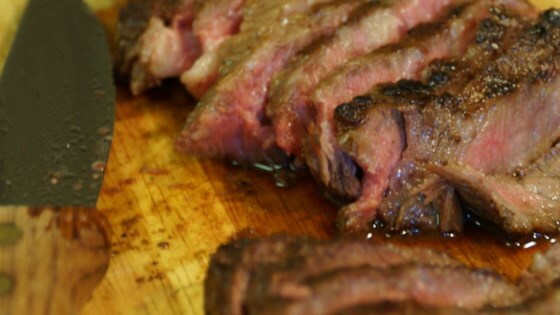 Fast, easy, imparts good flavor and doesn’t overpower the flavor of the steak. What more can you ask for? Perfect. 4.5 Stars: I added a sprinkling of seasoned salt, per other reviews, and we thought this was very good.